If you're new to the site, sometimes it can be difficult to get settled in. Picking an avatar, choosing a signature and joining groups can be difficult for those who have never used MyBB software before. The following is a guide to help with adding an avatar to your profile. The easiest way to spot a newbie is by the absence of basic profile information. To change that, you should be sure to fill out any profile info that you wish to share. None of it is required though, share only what you like. You should definitely add an avatar(or profile picture) to help people recognize that you are here to stay. Make an account at Photobucket, upload your avatar and the site will provide you with a direct link to your picture that can be entered into the 'Avatar URL' field. (Note: You should select the 'Direct Link' option and not the 'IMG code' as it is for adding images to posts, more on that later) Images that are too large will be automatically re-sized. Once you've pasted the direct link into the 'Avatar URL' field, then click the 'Change Avatar' button. If you feel comfortable using a graphics program, then you can just crop scale any photo to 100x100 to use as your avatar. To ensure that it meets the data size requirements, choose a smaller format such as PNG to store your pic in. Once you have your picture save just click the 'Browse' button to the right of the 'Upload Avatar' field. 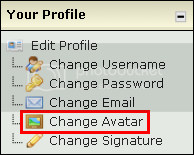 Then select the image from your computer and click the 'Change Avatar' button. That's all there is to it. Once you have an avatar uploaded you can ramble around the User CP and check out all the other options there. You can use gifs for your avatar, providing it's no bigger than 150KB. K thanks. Does it have to be a URL, or can I upload it? (05-26-2014, 06:50 AM)ColeMacGrath Wrote: K thanks. Does it have to be a URL, or can I upload it? you may upload your avatar.